The naming of plants is a peculiar activity. Some large nurseries now employ marketing agencies, copywriters and focus groups to help them name new cultivars and hybrids. Sometimes the results are amusing, often they are bizarre and occasionally tacky. The naming of genera and species is the job of botanists but at times even what they come up with can be a bit odd. Coreopsis is named from Greek: opsis, seeming or resembling and koris, a flea. So the plant is named because the achene (the case that contains the seed) resembles a flea. No reference to the showy, daisy-like flowers; no comment on the floriferous nature of the genus nor on the tenacious way some of them grow in difficult situations. What struck the person naming the genus was that if you looked carefully at the small seeds you might divine the shape of a bedbug. So much for the inspiring beauty of Nature. The name is reflected in the North American common name for the genus, Tickseed. Coreopsis (no, I won’t be referring to them as ‘Tickseeds’ ) are mainly native to America, with most species found in North America and the rest in Central and South America. They are long-flowering perennials and annuals that tend to be able to tolerate drought and extreme heat. In the wild they are mainly found in open, sandy meadows, and have successfully adapted to growing in the harsh conditions along motorway verges. They are so common along the highways of Florida that the genus has been adopted as the state’s official wildflower. Most species form domed, compact plants but C. tripteris grows up to 2m tall. The stems are narrow but strong, with fine, glaucous leaves. The pale yellow flowers have an attractive central boss of purple stamens. You don’t see it in gardens very often but it is far less coarse than the more popular Helianthus ‘Lemon Queen’ or Rudbeckia ‘Herbstonne’ that have a similar habit and colour. There is a cultivar, C. tripteris ‘Lightening Flash’, that has pale yellow foliage. I think the whole plant looks ill but many gardeners are very excited by it. Until ten years ago the most commonly-grown species in British gardens were C. verticillata and C. grandiflora. C. verticillata has 50cm tall branched stems of very narrow leaves that are smothered in yellow flowers from August to October. The cultivar ‘Moonbeam’ has pale, butter-coloured flowers, while on ‘Zagreb’ they are a much more vibrant yellow. C grandiflora is a burly plant with broad leaves and, as the name suggests, large flowers. C. grandiflora ‘Mayfield Giant’ has bright yellow flowers about 6cm wide and grows to 1m tall. In mild areas it will continue flowering until mid-November. Much smaller, growing to about half the this height, is C. grandiflora ‘Early Surise’. 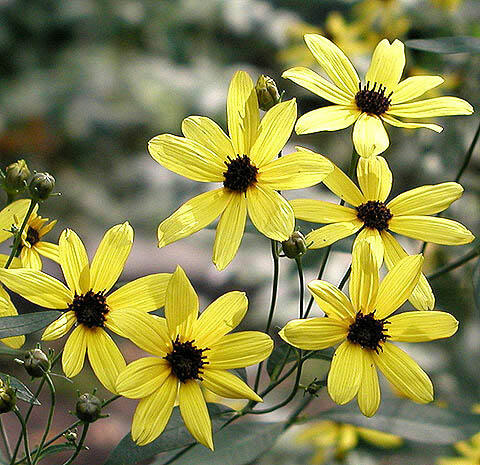 It has semi-double golden-yellow flowers that first appear in June and finish with the first frosts. Both cultivars last well in vases and so are often grown in cuttings gardens. The species and the older cultivars all tend to have cream or yellow or orange flowers. At the turn of the century Limerock Farm Plants, a small nursery in Rhode Island, introduced Coreopsis ‘Limerock Ruby’, a compact plant with deep, ruby-red flowers. This colour break, and the excitement that greeted it, has led to the introduction in the last decade of barrow-loads of new Coreopsis hybrids. ‘Limerock Ruby’ was followed by the lavender-pink flowers of ‘Limerock Passion’ and the apricot flowers of ‘Limerock Dream’. Since then the diversity of flower colours and petal shapes of new plants has been astounding. It seems that every shade and tone of red, pink, yellow and cream, often in combination on the same plant, is represented. Breeders’ catalogues have begun to resemble colour charts. Terra Nova nurseries have introduced a ‘Lemonade series’ which has plants with golden foliage. Others sport evocative and names such as ‘Cherry Pie’, ‘Mango Punch’ and ‘Tropical Lemonade’. All of these new introductions are as prolific, long-flowering and easy to grow as their ancestors, qualities which, together with their sparkling flowers, make them a major asset in any garden. Whatever they are called. The explosion in numbers of Coreopsis is similar to that of another North American native, Echinacea. And as with Echinacea, many of the new hybrids are turning out to be neither as robust nor as hardy as older introductions are. Treat them as tender perennials, giving them the protection of a frost-free greenhouse during the winter, or grow them as annuals. The American term ‘temperennial’ is starting to appear on garden-centre plant labels. This is a synonym for a tender perennial. 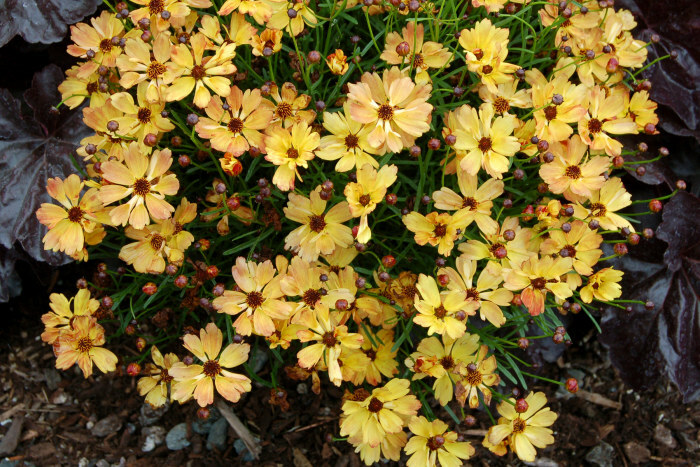 Grow Coreopsis in full sun on free-draining soils. Unless your soil is extremely poor, don’t enrich it with compost as rich soils encourage leggy plants with fewer flowers. Although they will tolerate drought, they will stop flowering and begin to look tatty after a long spell of dry weather. A bucketful of water at the base soon perks them up. They grow well in containers but, as with most plants grown in pots, they will need regular watering. To keep the plants flowering they need regular dead-heading. I don’t have time to remove individual flowers so I give the whole plant a trim when its flower production starts to wind down. Plants bounce back very quickly from this treatment with a new crop of flowers. Some new hybrids are described as ‘self-cleaning’ and are said not to need deadheading but I have found that they benefit from being cut back as much as other plants. At the end of the season leave seed heads on the plant as food for goldfinches.